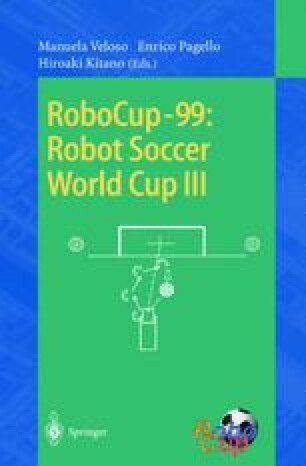 One of the interesting challenges in designing a successful robotic soccer team is the need to cover the entire loop from sensing over deliberation to acting. For example, successful ball passing needs good estimations of the position and velocity of the other players and the ball, projections into the future, planning ahead in order to create and exploit opportunities, and, finally, it requires to act accordingly. This work has been partially supported by Deutsche Forschungsgemeinschaft (DFG) as part of the graduate school on Human and Machine Intelligence, by Medien- und Filmgesellschaft Baden-Württemberg mbH (MFG), and by SICK AG, who donated a set of new generation laser range finders.